Amazon delivered all of the technology and now I had to figure it all out. Setting up the microphones, CloudLifter preamp and the Mackie mixer was straight forward for me. I spent plenty of time in my previous life as a glorified garage band rock star, so I was already familiar with microphones and mixers. My original plan was to send a direct audio feed from the mixer into the Mevo video camera so the audio and video would be captured in one place, synchronized and requiring minimal effort. I quickly realized that wasn’t going to work. 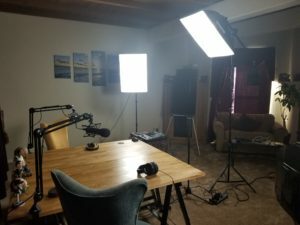 I went through various machinations of trying to connect the XLR out from the board into a mini USB input into the camera, but none of the interfaces I purchased would work. I spent an entire Saturday driving down to Guitar Center in La Mesa multiple times plus visiting Fry’s and Best Buy. Different recommendations from different people. It was a cluster. I eventually abandoned the idea. What I came to realize is that I would need to capture the audio and the video separately and then synchronize them in post production. Fortunately I already have an Adobe Creative Cloud subscription that I use for my marketing agency (Photoshop, InDesign, Illustrator, etc. ), so I am already paying for Adobe’s entire suite of products including Audition and Premier. Audition is a great audio production program that is popular with podcasters and has podcasting templates setup to simplify the process. It was easy to get the USB out from the mixer to go directly into my computer where I can capture my two microphones on separate tracks. I can then add additional tracks for intro music, sound effects, etc. Perfect. I did a test run and the mixer captured the audio nicely. The quality is excellent and the ability to edit/mix within Audition and export to an optimized MP3 for podcasting should be perfect. This will be the way I create the audio file that I will upload to Apple Podcasts, Stitcher and other audio podcasting platforms. In exploring Premier, it has many of the same audio capabilities as Audition with a deep set of tools to manage video. Premier offers multiple ways to sync the audio and video, so I should be in good shape. The Mevo video camera will store the video on a mini SD card which I will load into my computer and import into Premier. Once the audio is synchronized, I should be able easily output a video file that I can upload to my YouTube channel. I feel somewhat comfortable with Audition, but I have a learning curve in front of me with Premier. With all of the online tutorials and how-to videos, I don’t expect this to be a heavy lift. It will be a fun adventure to figure it out. 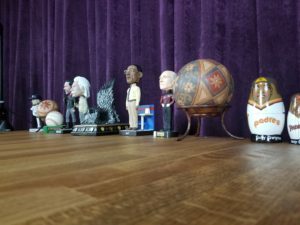 In a previous journal post I shared how my living room was setup as a home theater by our previous owners. When I close the heavy drapes and use my remote to launch the curtain open/close automation, the room gets really dark and provides a terrific acoustic environment. 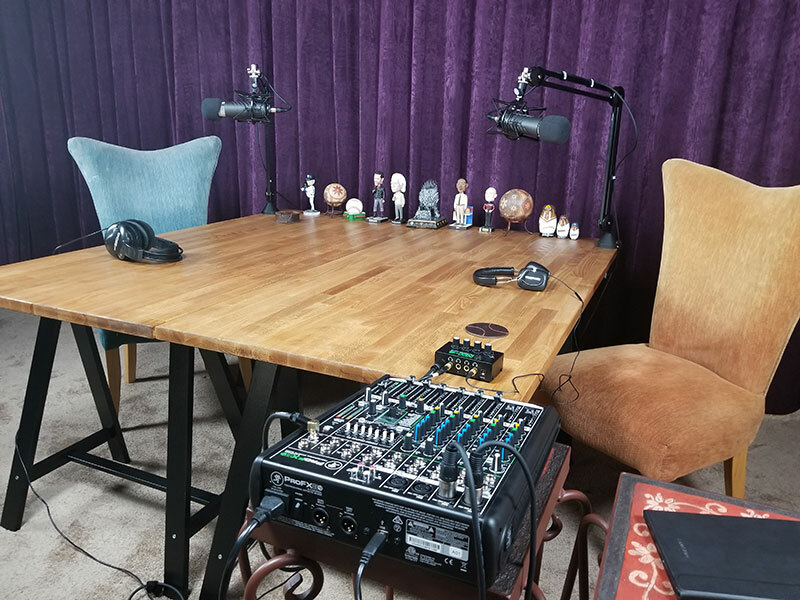 I also purchased a professional 3-light setup and it works very well in the living room (errrr… cough… cough…) professional podcast studio. The lighting is easy to use, produces a great result and can be easily adjusted as necessary. I needed a table. I am roughly modeling the studio after the Joe Rogan Experience. 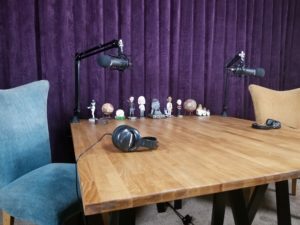 I like Joe’s long table that can handle 2 or more people in the podcast. I discovered local artisans that specialize in making custom barnwood tables that offer a cool, farm house type of vibe. But those tables start at about $1000 and quickly go up in price from there. That wasn’t in the cards in my “just get started” mode, but it did give me the creative idea to have a custom table built that looks like an authentic castle door that would be on the Game of Thrones set. Maybe someday. In the meantime, I needed something simple, so off to Ikea I went. Two tables and a day of prepping the wood with Danish oil finish and I was in business. This is supposed to be a fun project, right? 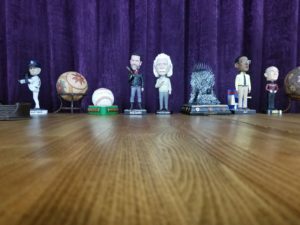 So I purchased a few bobble heads (Gus Fring, Negan, Einstein, Jean Luc Picard) and a miniature version of the Game of Thones throne. I’m still working on adding more decorations to make the video interesting and entertaining. Send me a note if you have a good idea. Now it’s time to book my first guest for the show.